The media-centered view places more emphasis on the media, which appears at the top of the screen, while the text comes below. Had Scalar been available when I taught this course, all student work would have been placed in a view such as this since it features a focus on the digital argument but also allows the statement of purpose (and the list of works cited) to exist in a form that is more appropriate for text, rather than scrolling across the screen at the end of the digital argument. 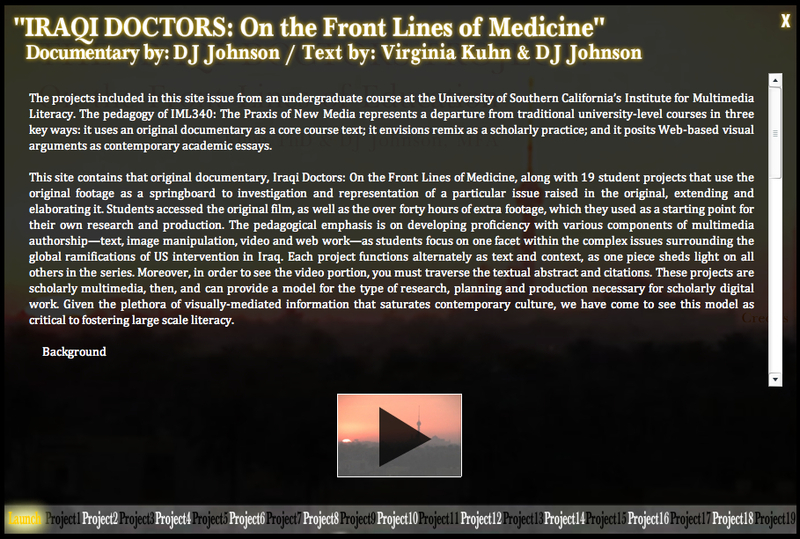 Indeed, in the Iraqi Doctors web site, we built the projects such that one cannot view the video component without at least traversing the text. The site was built with funds from the USC Fund for Innovative Undergraduate Education, but it is untenable to build a new site each time the class runs. We simply lack the resources to do so. Further, tools like Flash are not text-friendly and too often one has to chose between privileging word and privileging image. Scalar levels the semiotic playing field and becomes the ideal environment for scholarly digital arguments. Discussion of "Media Centered View"
Version 12 id 9401 of this page, updated 05 September 2011 by Virginia Kuhn. Created by Virginia Kuhn. 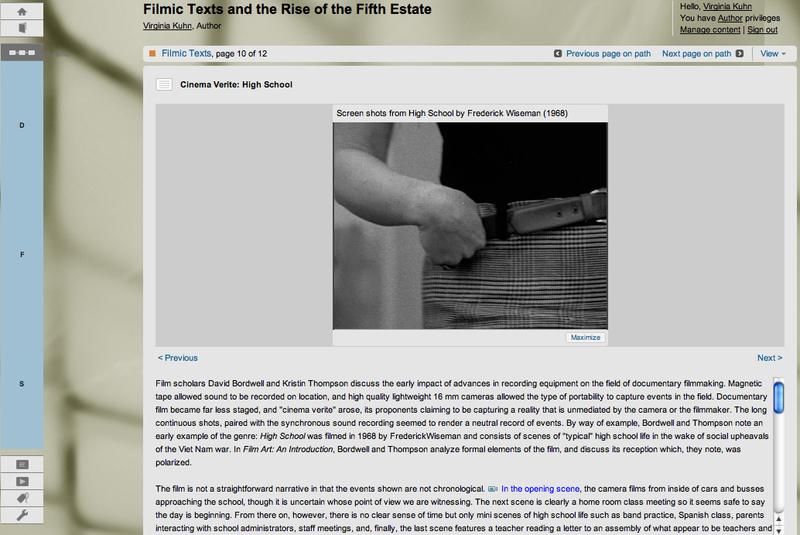 Filmic Texts and the Rise of the Fifth Estate by Virginia Kuhn. Help reading this article. Published by the International Journal of Learning and Media. Powered by Scalar.